If there is no God, then all that exists is time and chance acting on matter. If this is true then the difference between your thoughts and mine correspond to the difference between shaking up a bottle of Mountain Dew and a bottle of Dr. Pepper. You simply fizz atheistically and I fizz theistically. This means that you do not hold to atheism because it is true , but rather because of a series of chemical reactions . . . . Morality, tragedy, and sorrow are equally evanescent. They are all empty sensations created by the chemical reactions of the brain, in turn created by too much pizza the night before. If there is no God, then all abstractions are chemical epiphenomena, like swamp gas over fetid water. This means that we have no reason for assigning truth and falsity to the chemical fizz we call reasoning or right and wrong to the irrational reaction we call morality. If no God, mankind is a set of bi-pedal carbon units of mostly water. And nothing else. From a debate between Farrell Till and Douglas Wilson. See the transcript here. New Atheists such as Richard Dawkins and Stephen Hawking are confident in their atheism; even if they still have a few issues to tackle. Philosophers continue to ask them why consciousness and morality exist. Why do concepts of good and bad, wrong and right persist? Are such things outdated; should they be discarded? Once one begins to ask why certain things exist, it soon becomes evident that we must not only answer these questions but inevitably we must answer the greatest question of all, "Why is there something rather than nothing?" Can universes or God exist without a cause? Could either one be eternal? What are the inherent problems of a universe that simply came to be? What about a God who has always been? Is it logical to consider God the first cause who needs no other cause? Hawking maintains that for most things in the universe “it takes something to make something.” You can’t make a mountain of dirt without taking dirt from a hole in the ground. However, the universe, he claims, is the ultimate “free lunch.”3 Quantum physics suggests that subatomic particles can spring into existence out of nothing. I would want to check with other physicists to see if they would agree that this is what is happening at the subatomic level. Perhaps others would express it as, not knowing the source of such particles. But, for the moment, let us concede this point to Professor Hawking. He states that when we consider anti-energy, anti-matter, and other universes, everything sums up to zero. So, as long as the net sum is zero, the universe can come to exist out of nothing (at least nothing in our universe). Yet, for me, questions remain, why is there gravity rather than no gravity? Why are there particles and anti-particles to sum? Why are there other universes? Why is there something rather than nothing? 3 Some of this paragraph is a re-phrasing of a previous blog found here. Doubt (Speak It Plain) - A Follow-Up To "No Answer"
A line from the book says, "How can [the gods] meet us face to face till we have faces?" and Lewis once explained that a human "must be speaking with its own voice (not one of its borrowed voices), expressing its actual desires (not what it imagines that it desires), being for good or ill itself, not any mask. "3 May we all "know this love without a doubt . . . And in the dark and holy places . . . just come undone." 1 Lewis, C.S. Till We Have Faces: A Novel of Cupid and Psyche. New York: Houghton Mifflin Harcourt, 1980. Dalmatia today remains a testimony to the lasting influence of a single life. We do not know much about humble Titus. It appears that he did not write anything that tells us more about himself. All we have are 16 verses in the New Testament that tell of his work, mostly done alongside Paul.6 Yet, the fruit of his labour can be seen in Dalmatia today. Of course, if Titus had not taken Christian teachings to Dalmatia it is likely that someone else would have; and Titus was not the only evangelist to travel through this region with the Gospel. Others built upon his work to make the region what it is today; but, the point is, Titus did go to Dalmatia. He started something there. It stirs my imagination to think that you and I can have, and may already be having, a significant influence on generations that follow. It is a humbling and sobering thought. Five-hundred is a nice round, satisfying number. As I write my five-hundredth blog I pause to think of the significance of the words written in this space. Although there are many empty words in our world, words can, and do, make a difference. I pray that some of the words in this blog have made a positive difference and that none, or at least few of them, have been hurtful. Being born in a country where English is the dominant language, I am blessed to be able to communicate in one of the most prolific languages of the world. People from all over the world seek to learn the language that was modeled for me in my home and taught to me in school. Yet, it is important to note that languages come with a cultural bias; and as a writer, it is good to have a sense of your biases. I recognize some of my own prejudices while other predispositions remain a mystery to me. We can all be helped by those who point out the angle from which we look at our world. I would ask you, my readers, to help me with this as you have opportunity. I also pray that my words might challenge your own understandings of the world and might encourage you to change your thinking on some subjects. I write much about science, faith, God, justice, care for one another, and music. There is plenty of room for disagreement in each of these areas. May we challenge one another to think beyond our parochial perspectives and self-limited understandings. As in relationships, the most important aspects of writing are honesty and sincerity. Words and relationships are tightly intertwined as illustrated by the words of this familiar Bee Gees song. We can readily see what an ugly use of words that could be. Words work best when we use them in honest ways to carefully explain our beliefs. Others can then compare them to their own beliefs and honestly challenge them in places where the words may yet be lacking. In this way the discussion moves forward and we walk away with greater understanding and greater truth. It's only words, but words are all we have to help each other understand our thoughts, emotions, and beliefs. My prayer for each of us is that our words may be true and sincere. May our words be precise and precious. May our words be as few as necessary and as grand as possible. May our words be the seasoning of life that flavours the goodness of the world around us. Thank-you, reader, for joining me on this journey of words on the occasion of my five-hundredth blog. 1 "Words," written by Gibb, Maurice Ernest / Gibb, Robin Hugh / Gibb, Barry Alan. C.S. Lewis tells a story in one of his novels of a queen who writes two books from two perspectives. The first quote is from book one; the second from book two. I say, therefore, that there is no creature (toad, scorpion, or serpent) so noxious to man as the gods. Let them answer my charge if they can. It may well be that, instead of answering, they'll strike me mad or leprous or turn me into beast, bird, or tree. But will not all the world then know (and the gods will know it knows) that this is because they have no answer? . . .
Lewis, C.S. Till We Have Faces: A Novel of Cupid and Psyche. New York: Houghton Mifflin Harcourt, 1980. The May 17 issue of Science News features a series of articles about Europa, the fourth largest moon of Jupiter. Europa is perhaps the most interesting moon in our solar system. At roughly two thirds the size of our own moon (with a mass of just 0.0080 times the mass of earth) it is still a small world; but what makes it interesting is its potential for life. Whereas Io is covered in volcanoes (over 400 active on the surface) and Callisto and Ganymede are covered in equal parts of silicate rock and water-ice, Europa is completely covered in frozen water. Recent observations suggest that beneath this thick crust of ice lies a vast ocean; and, there is also much conjecture that it could be possible for life to exist in this ocean. Arthur C. Clarke, the British science fiction writer, imagined an ocean with intelligent life on Europa in his Space Odyssey books (particularly 2010: Odyssey Two and 3001: The Final Odyssey). Clarke is no light-weight when it comes to scientific predictions, having written scientific papers in 1945 that proposed geostationary satellites before the first one was put in place in 1963. Could Clarke have been prophetic about life on Europa? If pressed about his stories of Europa he would surely say that writing of intelligent life was purely imagination; but that simple microbial and bacterial life would be much more of a scientific possibility. Arthur C. Clarke once said, "I'm always paraphrasing J. B. S. Haldane: 'The universe is not only stranger than we imagine, it's stranger than we can imagine.'" 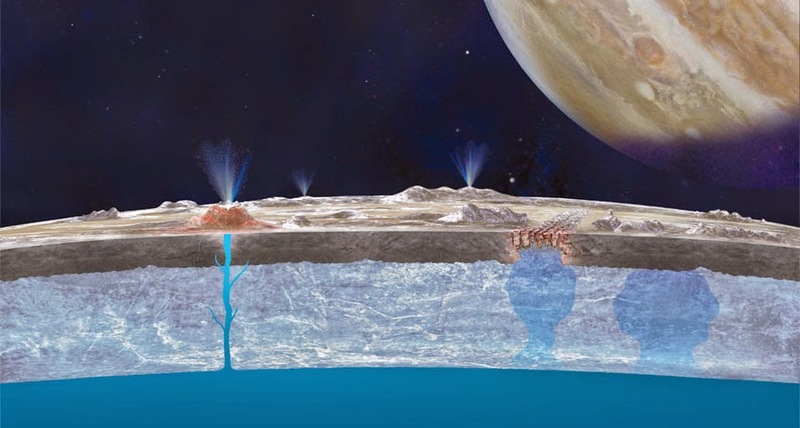 Today, there are scientists working to test hypotheses about microbial life living in thermal vents in the ocean floor of Europa. If such life could be detected it would be a dramatic discovery that would revolutionize our concepts of life in our solar system and in the universe. Would such life be carbon based? Would they replicate by sexual reproduction? Would they contain deoxyribonucleic acid (DNA)? If they did have DNA would they use the genetic code of the majority of life on earth, the mitochondrial DNA code, or a novel genetic code? Such questions would immediately spring to the minds of scientists and would soon be on the lips of people at Tim Hortons and Starbucks shops around the world. No, this is not some sort of nerdy exaggeration, people would find such things fascinating if such a revolution occurred. Of course the theological ramifications would be significant. The Copernican revolution taught us that the earth is not the astronomical centre of the universe and that the earth revolves around the sun, not the other way around. This had to be considered as humans thought about their place in the universe. Could humans still be a special part of God's creation if they were not located at the geometric centre? The exobiological revolution of finding life on another planet would lead to an exotheological revolution in which we would again need to consider our place in God's economy. We would have to ask, "Is life on earth really all that special?" If life could develop on two separate worlds within one solar system, how many more life forms might there be in the entire universe? Might some of them have developed communication with one another? Could they communicate with us? Might they pray to our same God? Might they pray to another god? All of these questions and more would become much more significant the moment life was detected elsewhere. The articles in Science News suggest that the ability to fully test the hypotheses is still ten to fifteen years away. I hope to live to see the day when there are ice-drills on Europa as we seek the answers to these interesting questions. Click on thumb-nail image for a larger photo. I have come to appreciate that life is not easy. I know that God has created a world that is hard work, challenging, full of temptation, and sometimes painful. I understand that this is how He prepares us for living in heaven. I know that He is concerned with "soul-building." I do not want an easy life. I see how easy it is to be reckless and inattentive when things are going well. Just yesterday, I'd had a wonderful week at a conference and church meetings and preached a challenging sermon at our church about avoiding anger, arrogance, and dishonesty (Titus 1:5-9); then, I confess, to the Body of Christ on the internet, I promptly got into an argument with my wife in which I was angry, arrogant, and loud. What an awakening from complacency! I need difficulty and challenge in my life to keep me alert to the actions of the Enemy. Those are some of the words to a song, written by Miranda Lambert, Nicolle Galyon & Natalie Hemby, in which they lament the days when things took a little more work. The song suggests that life really was better before so many things became automatic. The song-writers are correct. God wants life to be less than automatic and wants us to put time into our achievements. Here are the rest of the words to the song. So today, I confess my sins before God and before others and commit myself to once again seeking to live a life faithful to the Lord whom I serve. I embrace the difficulties and the hard-work; I am alert to the temptations and easy paths of life; and I rejoice in the life that God has given me. I will seek to put effort into this life and in this way appreciate the good life I have been given.